-16 SEP 2018: Hey everyone. Just a quick update. First of all, thanks for all of the sound feedback on the latest release. It has become quickly apparent that although much has been added to the jet, it still isn't quite ready for prime time yet. There are still many things to fix and tweak. Because of that, I'm going to re-title this 18.4 as a "Prototype" or "Test" version for those to check out and test and re-name the 18.3 as the latest stable release until I get the 18.4 smoothened out. Thanks again everyone for the support and understanding. -31 AUG 2018: Hey everyone. I know it's been a while and a little quiet, but I assure you steady progress has been made on the jet. This update comes with a fair amount of fixes for noted problems as well as a few new features, in particular the TACPACKers. A LOT of coding rework was done on this version, so I have to warn you that there may be a few new bugs in this version compared to older ones. But this version is definitely a push forward none-the-less. 1. RADIOS: A lot of work has been done on revamping both the COM and NAV radios to have better functionality. The new radios allow both VORTAC Freqs as well as TACAN channels to be entered and tuned. 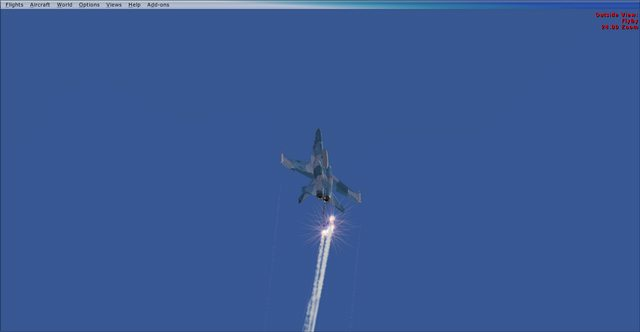 ILS needles and CRS arrows have been fixed as well. This includes both land and carrier ops. 3. TACPACK Stores Management System (SMS) (TACPACK ONLY): Both the SMS display and Fire control system has been redone to closer match the real deal and for smoother and more consistent operation. User now has the option to select between HI and LO gun rate via DDI display. Framework has been set up for future weapon deployment options and details. 4. DDI Menu Layout: New DDI Menu hierarchy has been implemented. Displays are now divided into two primary menu pages, the "TAC" page that display all tactical related displays, and the "SUPT" for support related displays. The user can switch between TAC and SUPT menus by first pressing MENU at the bottom center of the DDI and then pressing MENU again to switch from one to another. Please not that "MENU" lettering changes to local zulu time (minutes and seconds) once airborne. Menu functionality however, still remains the same. 5. 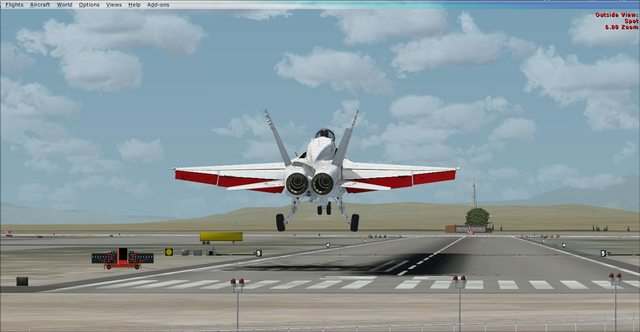 RADAR WARNING RECEIVER (RWR) (FSX TACPACK ONLY): New RADAR Warning Receiver (RWR) has been implemented on the circular scope just below the right DDI. As most of you know, it's purpose is to warn of incoming threats by displaying icons on the display based on the azimuth of the threat and priority, which determines which ring in which the threat is displayed. Although functional, this new feature is still being tweaked. 6. 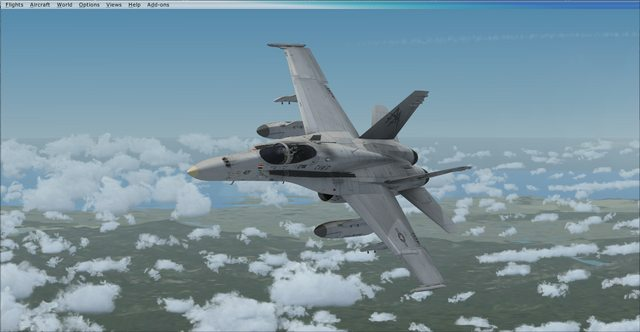 Electronic Warfare (EW) (FSX TACPACK ONLY): Also new and using the same logic as the RWR, is the new Electronic Warfare (EW) Page which shows same info as RWR but on DDI along with Chaff/Flare status and option to arm Jammer. The EW page can be selected by selecting the "EW" option on the TAC menu. -The FLIR display only shows on the Right DDI due to coding limitations from VRS. -Both the ASQ-228 must be selected from the Payload Manager (Shift + 7) and the FLIR switches much be on for the display to be shown. The switches are located on the right, rear panel (where your right hip would be). -Basic functionality has been built into the display such as contrast, brightness, zoom and polarization. These options are displayed on the right DDI within the FLIR Display. -Currently, the FLIR camera is set to automatically point to whatever ground contact you have selected on your RADAR through the use of the "TUP" and "TDN" options. There is no option to independently move or slew the camera as of this time. 8. 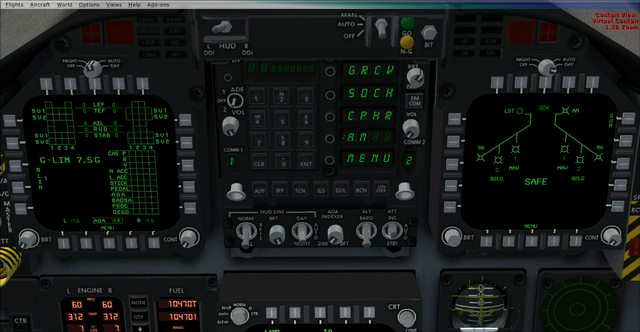 Helmet Mounted Display (HMD) (FSX TACPACK ONLY): Just as new for the jet is again, a very basic Helmet Mounted Display As of now, it just displays basic HUD info. The HMD can be activated and deactivated by clicking on the small knob titled "HMD" located just above the stripped "SPIN RCVY" switch, which can be found on the right side of the right DDI. -Tracks a maximum of 8 targets at a time, depending on which mode is selected. RWS (AA), MAP (AG), GMT (AG) and SEA (AG) modes all track up to 8 contacts simultaneously. TWS (AA) tracks up to 4 contacts at once, while ST (AA) tracks only one. -Contacts shown can be cycled through by pressing the TUP and TDN options located on the right side of the display. Once selected, a bracket will appear around the contact, as well as the contacts altitude (in thousands of feet), airspeed (in mach) and a tail indicating the heading in which the contact is headed. 11. FCS RESET BUTTON: The FCS Reset button on the left panel is now functional. Once pressed, all of the Proportional Integral Derivative (PID) Devices that controls the aircraft's Flight Control System (FCS) are momentarily blanked and reset. This is useful for uncommanded pitch, roll or yaw oscillations encountered while in flight where the FCS starts to go wonky. 12. TEXTURES: Updated cockpit and canopy textures. Thanks Kea and Ed! Well those are the biggies. Bunch of other smaller fixes and adds. Big thanks goes to Corrado, Dino Cattaneo, Pat (PhantomTweak), Kea and Ed for all the updates, textures, help and testing! As usual, I'm always open for comments, discoveries, recommendations and feedback. I've provided an autoinstaller this time. Should be easier and more straightforward to install. And......and....as usual.....don't ask about the Delta (two-seater) version. 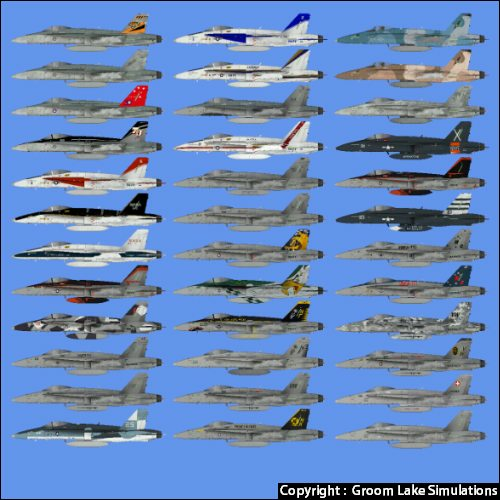 --Thanks to the contributions of GROOM LAKE SIMULATIONS and a few others, we now have over 80 great textures for the jets! I'll update this post with any NOTAMs or FAQs regarding the FCS gauge too. Hope you family does well, too. Looking forward to seeing you back hard at work on this incredible bird. No rest for the weary, is there? Orion: Good to hear from you. Seems like it's been a while. Hope you and yours are doing well. -I've decided to start a new thread so I can have a little more control over posting and updating the tread. All updates for the project will be posted here. Please post inputs and feedback here as well. Thanks. -One of the more enjoyable (or painful) aspects of being active duty military, is that you have to PCS (Permanent Change of Station) from time to time. I am currently in the process of moving from Hawaii to Italy, and my household goods (gaming/coding computer included) isn't scheduled to make it to Italy until mid-December. That being said, expect slow progress on the jet as I will not be able to make many changes, updates or fixes to the project until then. 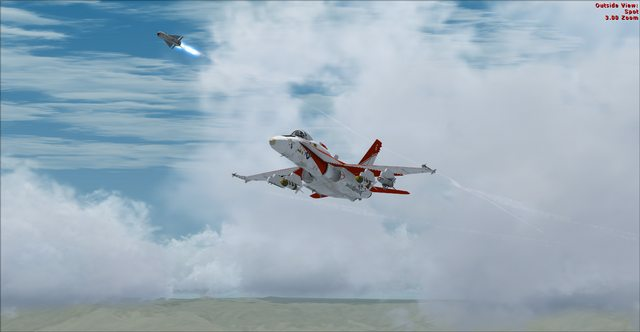 -P3Dv4 Version still in progress. -Don't ask about the Delta (two-seater) version. Just a heads up on that link for the new version posted above. The link above points to a manual install not the auto installer. Not sure if Jimi intended to link to the manual install or auto installer. Just FYI. Should be fixed now. Thanks for the heads up. Thanks for the good words Pat! Wow, tough duty going from Hawaii to Italy, guess I was in the wrong rate/branch or air wing guys just don't have it as good as we thought! Looking forward to more Tacpack testing in the future with this model. I don't want to hear about it! I was stuck in YUMA, a place I despise, for 7 of my 10 years. And I was on det for 6 months of my last year, which was in beautiful Beaufort by the Sea. My first 2 were in Millington, TN, going to school. And a little time in El Toro, CA, waiting for PCS assignment. Hated every minute, but I had property by then, and a family to raise, so I stuck it out. So yeah, I understand "Wrong rate or airwing"! 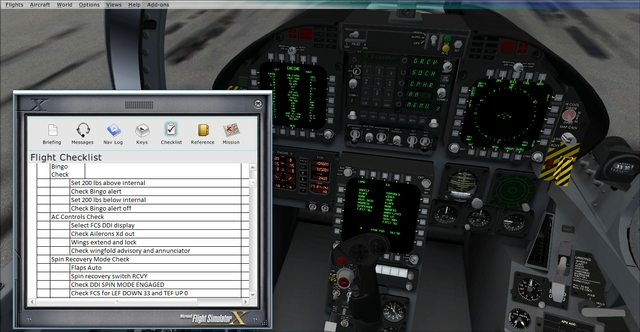 Some of the cockpit sounds don't work for me in P3Dv4, for example the high AoA sound, AoA.wav. 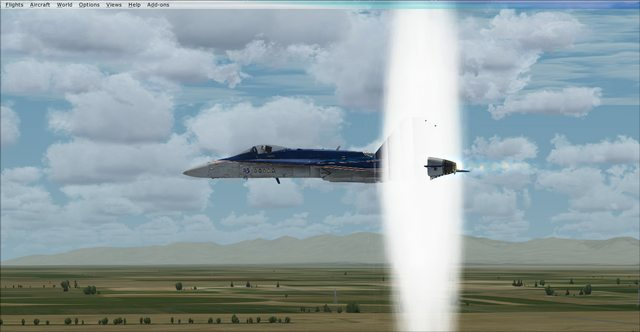 I definitely had at least some more sounds working in P3Dv3 and years ago in FSX. Also I'm getting a lot of tail wagging with the rudder with this current version (17.1.31). Regardless, great work on this jet! 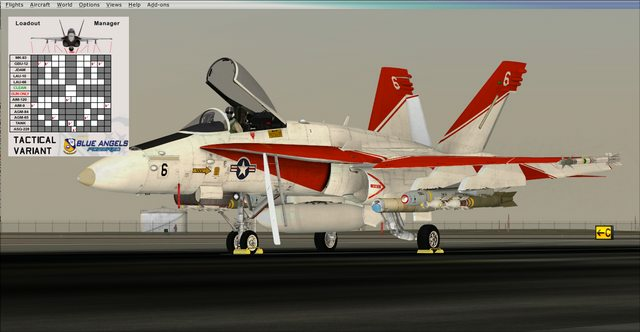 Just install newest ver of FA18C in P3DV4. Attempted to follow all the "fixes" for the 64 bit system but still no DDI's. Is that normal for this stage of development? Is there a way for me to change the blackout effect, or raise the G-limit where it occurs in the cfg? Doing a loop at 5 G and everything goes black, stays like that uncomfortably long. Is this supposed to be realistic? Would also like to change the in-cockpit turbine sound or lack of, there is no change of pitch with throttle changes. Sounds great outside the aircraft. As to whether you can alter the in-built G effect: No, there's no way I ever heard about to change the effect of the values there-of. Second way you can do it is to get into the sound.cfg and change some settings. If you want to try that, I can show you what needs to be done, but I suggest the slider method first. MUCH easier and simpler. Turning up the sound isn't the issue. It sounds like a monotone APU in the cockpit, not like I'm strapped onto 2 F404's. I would like to hear the change in engine tone and pitch when modulating the throttles. View outside the aircraft sounds great, it would just have to be less volume in the cockpit. I would like to change the sound.cfg, just can't tell which section or what values to change. Back to the G effect issue. What is going on here? Is no one else perplexed by this? 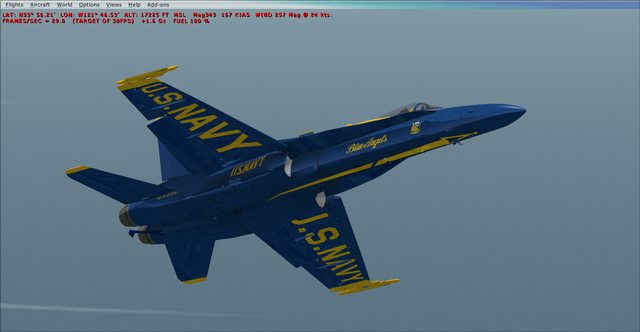 Has the F-18 been downgraded to a 5G limit, or is this some Blue Angels customized setting because they don't wear G-suits. 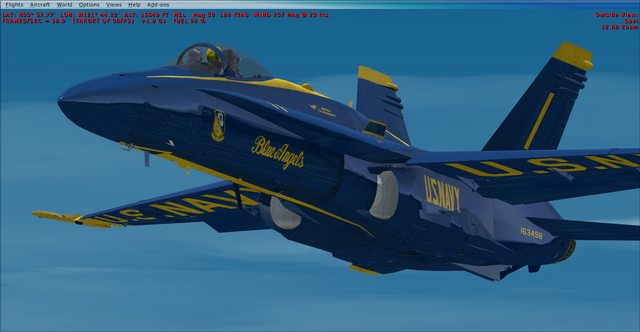 I black out at the top of my loop, stays that way for 10 seconds until the jet completes the loop and is heading back up the vertical. 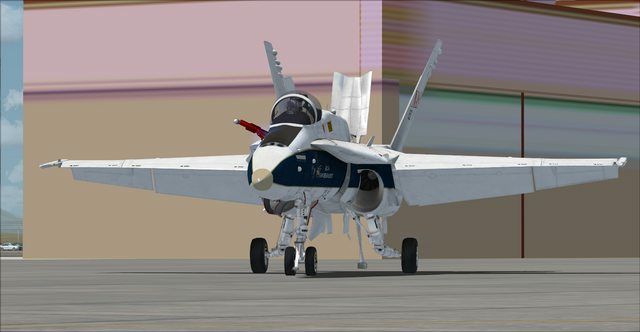 I've been reading about this F-18 for quite some time, with all the work done and experts contributing to the flight model. But this..its beyond words.. frankly.